The Libyan National Army Air Force — part of the eastern-based Tobruk regime, one of two competing governments in Libya — lost two fighter-bombers and an experienced pilot in fewer than two weeks. A MiG-21 shot down over the Al Sabri district in Benghazi and a second MiG-21 that crashed near Tobruk after a mission to Derna, killing the commander of Gamal Abdul El Nasser air base. The LNA/AF, under the command of Gen. Khalifa Haftar, also lost a Mi-35 gunship helicopter that the air arm abandoned at Ras Lanouf air base during a militant attack — and then destroyed. The losses have sharply reduced the LNA/AF’s combat capability as it battles western-based Misrata militants who are determined to hold Libya’s central oil crescent. The attrition rate of the LNA’s warplanes is high compared to that of other air forces. Since Jan. 1, 2016, eight aircraft — three MiG-21s and five MiG-23s — as well as six helicopters, including two Mi-24/35 gunships, have been lost either in accidents or shot down. The continuous refurbishment of aircraft stored for decades in hangars or outdoors, using spare parts from Russia and Egypt, is no longer sufficient to maintain the fleet. 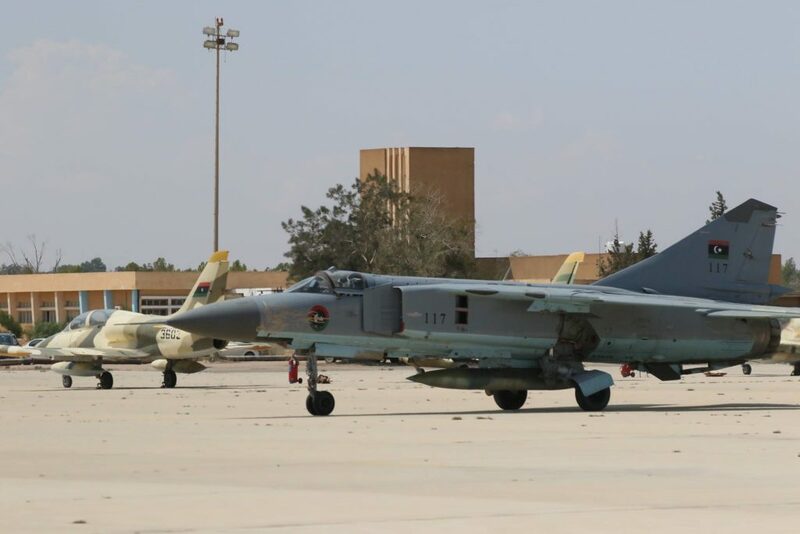 During the same period that the LNA lost 14 aircraft, it renovated just six MiG-23s. Haftar’s forces lost more aircraft than they can restore. The Libyan National Army Air Force has potentially 18 fighter-bombers remaining in its fleet, including 14 MiG-21s and four MiG-23s. There are also seven Mi-24/35 gunship and 14 transport helicopters, but with the exception of the MiG- 23s — which are all engaged in the fighting — only a handful of MiG-21s is operational at the moment. As for helicopters, it is difficult to know their availability rate because many of them no longer wear any identification number — part of the LNA/AF’s effort to mask their quantity. Haftar can only rely on around 10 aircraft to carry out his “anti-terrorist operations” against Misrata forces. In February 2017, Russia delivered a few MiG-23s t0 Haftar’s forces. They’re still being reassembled. Even these reinforcements will only partially make up for the lack of operational equipment. Moreover, most of Libyan pilots are veterans of the pre-civil war period. Frankly, they’re old. Their replacement by a newly-trained generation takes time. Indeed, some of the 35 cadets who graduated from the Egyptian air force academy in July 2016 are already at the LNA’s Benina air base or in training on two-seater MiG-21s at Gamal Abdul El Nasser air base close to Tobruk. But these new pilots haven’t flown in combat yet. Moreover, it’s difficult to train new pilots on the MiG-23 because there are no longer training courses on this type of aircraft in the few big air forces still using the type. The LNA has to write its own syllabus. Lacking planes and fresh pilots, the Libyan National Army Air Force likely finds it difficult to carry out offensive operations in southern Libya in the region of Sebha or to the west toward Misrata without foreign support. The United Arab Emirates, which apparently supported the LNA during the fighting over the oil terminals last month, won’t be able to fly close-air-support missions in the south or the west of Libya because of the UAE’s Air Tractor attack planes lack the range to reach the oil crescent from the Emirate’s Al Khadim air base, in southeast Libya. The UAE has been expanding Al Khadim, as shown in satellite photos at the beginning of March 2017. But the work is incomplete and so the Emirate cannot deploy longer-range fighters. Since the beginning of December 2016, only half of the surface has been hardened, which suggests jets won’t arrive before the summer. 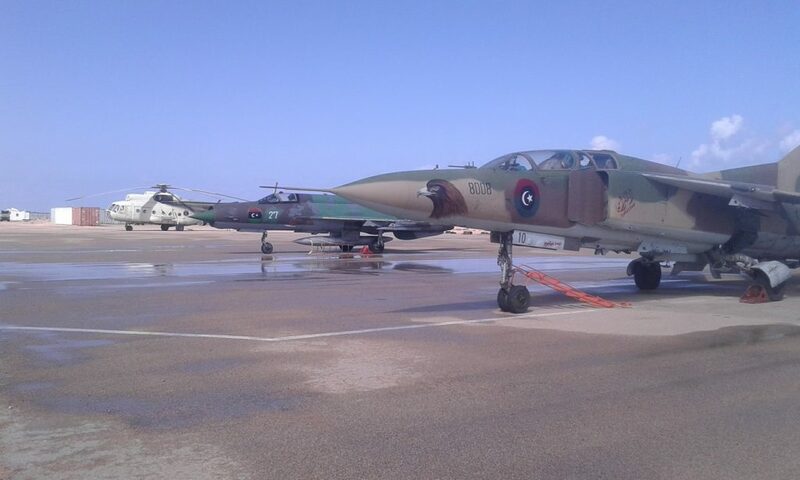 The only aircraft available to the LNA in the west, near Misrata, are one Mirage F1, two Su-22s and a Mi-35 helicopter, all of them at Al Watiya air base in the Zintan area. The LNA only uses these aircraft for reconnaissance and surveillance of border areas. April 5, 2017, the LNA Air Force launched air strikes on Tamanhint air base 30 kilometer northeast of Al Sebha, where fighting had broken out between two Misrata groups — the 3rd Forces and the 201st Infantry Battalion — against the LNA’s 12th Brigade. Misrata’s own air force launched retaliation bombings near Brak Al Shati air base — 80 kilometers north of Al Sebha — where LNA aircraft, possibly MiG-23s, supposedly had staged. A Misrata spokesman claimed the air force’s L-39 light attackers, pictured at top, destroyed one LNA MiG on the ground. Brak Al Shati and Tamanhint are more than 500 kilometers from Ras Lanuf and Misrata and more than 800 kilometers from Benina air base. To hit Misrata forces in the oil crescent, LNA MiGs — probably loaded with just four bombs — had no choice but to land at Brak Al Shati air base for refueling before continuing their missions. Misrata retaliatory raid showed that it’s possible to sever the LNA’s aerial infrastructure. In short, the LNA is running out of planes, pilots, bases — and options.